Jeff Turner Q&A: Magic’s biggest improvement, greatest needs? Rookie Victor Oladpio, who has a 78 percent free throw percentage, helped the Magic improve at the line this season. For the final time this season, FOXSportsFlorida.com checks in with color analyst Jeff Turner to get the latest on the Magic. You can follow Turner on Twitter at @JTurnerMagic. 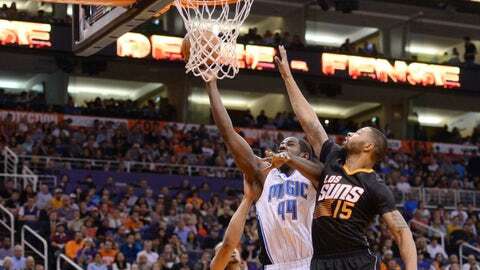 FOX SPORTS FLORIDA: Where have you seen the biggest improvement on the Magic from last season? JEFF TURNER: I think there are a few things. Defensively, there’s been improvement. You can look at the way this team, for the most part, has protected the paint. They’ve been in the top five most of the year in teams protecting the paint. The downside of that is we really haven’t gotten out to 3-point shooters probably as well as the coaching staff would like. But that’s a learning process, all those rotations. For the most part, they’ve done a good job in that regard. Offensively, one of the real weaknesses last year was the inability to get to the free-throw line. We really didn’t have a lot of guys attacking the paint. That’s improved, obviously. To go from worst to anything is an improvement, but they’ve made pretty big strides there. And obviously Arron (Afflalo) came back with a focus on getting himself to the free-throw line. He’s done that. 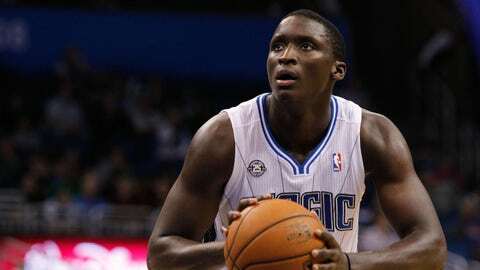 Victor (Oladipo) is pretty adept at it, as is Tobias (Harris). FSF: What are their biggest needs, and where do they need to get better at next season? JT: When you look at young players, the biggest area where you’ve got to get better is consistency. You’ve got to come and perform at a high level each night. That’s a process which young kids go through, that you have to learn. FSF: With both New York and Denver missing the playoffs, the Magic are assured of no worse than two of the first 14 picks in the NBA draft. Does a young team need two more rookies, or would you like to them package one of those picks to perhaps bring in a veteran? JT: That’s a great question. Do you want to get younger? The big thing that you have going into the draft is that you have options. You can address needs through the draft, or you can package, address through free agency. So they have the options because they’ve got those assets. Every area needs to improve. I mean, we’re at the bottom of the league, so we can improve in every area. If you go young, it just takes a little longer. If you add free agents, it might go a little quicker but you’ve got to add the right pieces. Even in losses, Magic coach Jacque Vaughn sees his young players learning lessons for the future. FSF: You’ve seen Dewayne Dedmon start in place of Nikola Vucevic at center for a few games now. How does he look to you? Is there anything about him which has caught you by surprise? JT: Every now and then, he’ll knock down a jump shot. He talked about it after the (win Wednesday night over Brooklyn) that he knows he can play. He’s long enough, and he can play on the defensive end. He has the ability to change shots; we’ve seen him do that. What I see in him is a hunger to stick on an NBA roster. I love the way he runs the floor, both getting back (on defense) and also getting ahead of other bigs in transition on the offensive end. When you look at those things that he does well, and you think about how long he’s actually been playing the game of basketball, he’s got a pretty good upside. FSF: What do you see as the biggest change in Jacque Vaughn from his first year of coaching? JT: From my (experience) coaching high-school basketball, you have to get comfortable in the role. You know the game of basketball. But whether you’re an assistant, a player, or both, sitting in that chair making the decisions is something you’ve got to learn. Every coach goes through it. You learn to be comfortable in that seat. And as I watch Jacque, I think he is very comfortable in doing that. I love some of the offensive stuff he does, particularly (coming) out of timeouts. You’ve got to have a play and get a bucket out of a timeout. That’s a big thing for coaches in our league. And as I watch him, the strength he has is the ability to relate to players. You can see he has a good relationship and a good rapport with the guys. FSF: Last question: Do you have any playoff predictions? For as much talk as there was during the first several months about Miami and Indiana being the only decent teams in the East, both of them have stumbled at times down the stretch. JT: It’s going to be interesting because I don’t think either Indiana or Miami really wants to see Chicago. And I don’t think either of them, if you look at it, wants to see Brooklyn. So it will be interesting if those two (the Bulls and the Nets) get through to the next round. There might be some surprises. Nothing’s going to shock me this year, (even) if we see either Miami or Indiana get upset in the semis. FSF: But there’s not going to be a No. 7 seed playing a No. 8 seed for the championship like we saw in the NCAA tournament, right?